Image sizes on Twitter have always been a little… difficult. Although you can upload an image of any size (within reason), until now they have all cropped to the same size – 1024 x512px (as you can see below). This has meant that up until now, you needed to consider how to optimise your images to allow for this size and shape. Last month, however Twitter announced an exciting development in how photos on twitter.com are displayed to allow for a ‘richer photo experience”. 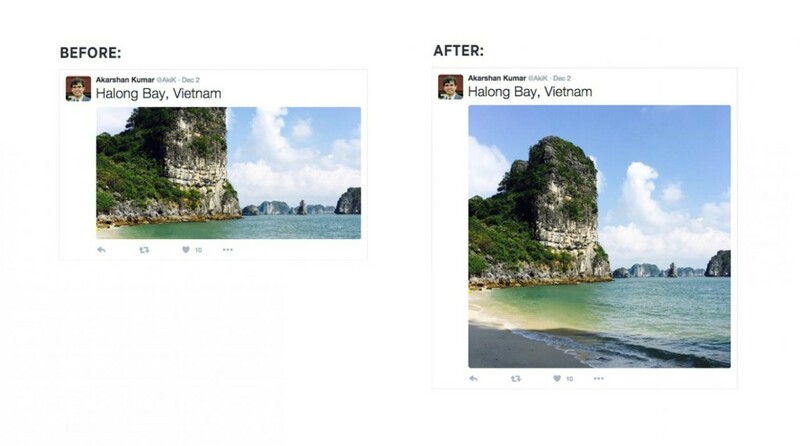 We’re making your twitter.com timeline more immersive by uncropping photos, so you can experience and present them as they were meant to be viewed. We’re also introducing larger, more beautiful multi-photo displays, which bring out more of each photo. I am really fascinated about how this might influence engagement on Twitter – will the larger image result in more interactions? However, there is one major drawback… this new feature will only be on twitter.com – not on the mobile apps. For many people, Twitter is predominantly a mobile platform, so marketers will need to look at whether they will prioritise their desktop or mobile audiences when choosing image sizes. For me, I’ll be sticking to the usual dimensions until this is rolled out more widely. Facebook’s Edgerank Alogorithm is what determines the content that you see in your newsfeed on the site. It has always prioritised content from friends and family over pages, with the reach of posts from company pages dramatically decreasing over the past 12 months. Over the past month, Facebook appear to have taken yet another swipe at the post reach of company / business pages. The move comes after users gave feedback on posts in their newsfeed, stating that they didn’t want to feel continually ‘sold to’ by companies. This emphasises the need for pages to post ‘softer’ and more engaging content. This is good news for Facebook users in general – they’ll be less noise, and in principle you should be getting more of what you want to see. For those who run company pages, it means that Facebook is increasingly becoming a ‘pay to play’ game, and appropriate adjustment of content will be required. If you’re a LinkedIn user, you’ve probably noticed that their mobile app got a complete overhaul in December. Often coined a ‘Facebook for your professional life’, the app really has taken this into account, adopting a similar style and feel to Facebook. The old app often felt quite clunky, so this is fairly refreshing. How do you feel about the new design? 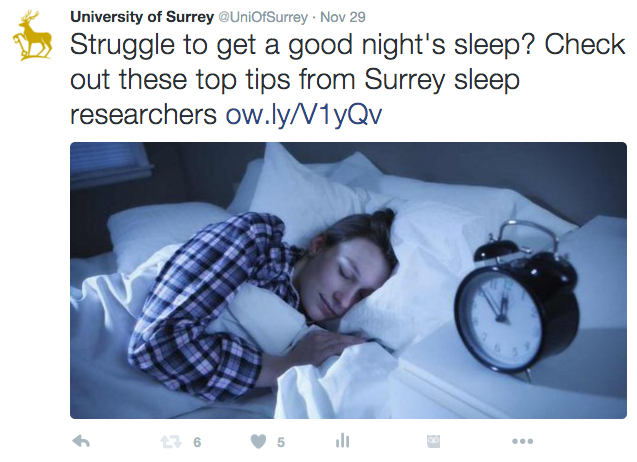 It demonstrates how your tweets have been performing in terms of impressions – fantastic for gaining an understanding of the best times of day to post. You can also click through to view your analytics in their entirety. 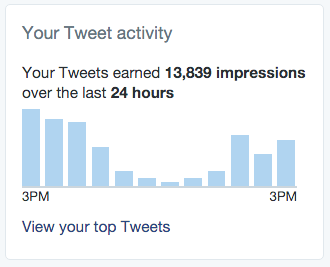 It’s quite likely that this is an attempt by Twitter to encourage users to make the most of their analytics feature. 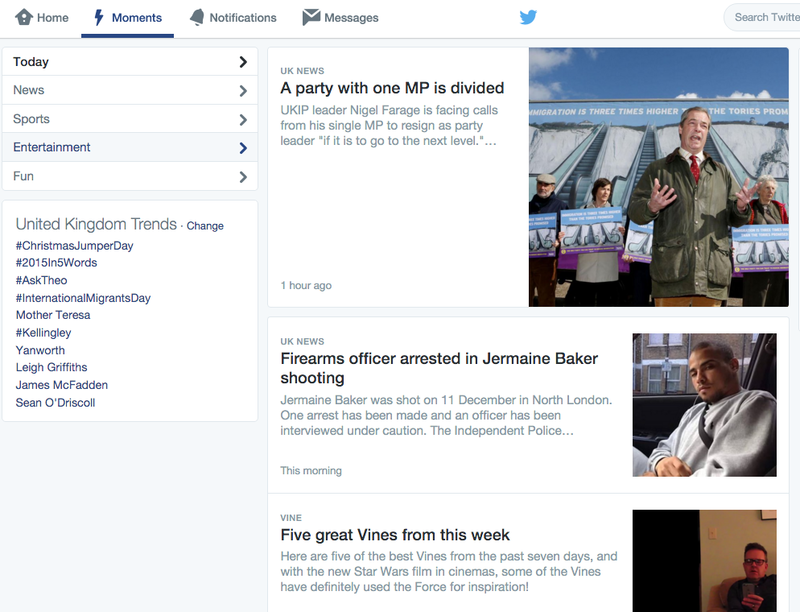 Twitter launched its new Moments feature in the UK, starting the roll out to all users from 15 December. Moments aims to bring you the news as it happens – all from official sources of accounts associated with the given event. Twitter has teamed up with a range of newspapers, sports channels and other news outlets to achieve this. A preview of the new Moments tab. It’s quite possible that this will make it easier to sift out the truth on Twitter – which is notorious for having users post something which goes viral, only for it to turn out to not be true at all. Speaking at Twitter’s London office, Moments UK lead stated that: “It’s not just about stars, celebrities. It’s also about eyewitnesses, people on the street, great one-liners, the conversations people are having, the whole diversity of the story on Twitter.” You can find out more about them here. Have you used Moments yet? We’re looking forward to seeing the social media surprises and developments that 2016 brings! Update on the twitter image sizes was really needed. Now we can atleast post image of any image without the fear of being cropped. Another update that twitter should now consider is to increase its tweet size as well. Already many social media freaks have suggested this but no action has been taken by twitter over this. Hope twitter rolls out this as well. I completely agree, I’m looking forward to them rolling this out for mobile too – I’m sure it’ll come in time! It’ll probably be something that they’ll consider, there are murmuring of a 10K character limit on the way… http://ow.ly/X2E4p but personally if they didn’t include the character count for including a link and image, this would be enough.